Boots and other types of protective gear are essential elements of general construction safety. Construction is a job full of potential hazards. Therefore, staying safe is of the utmost importance. 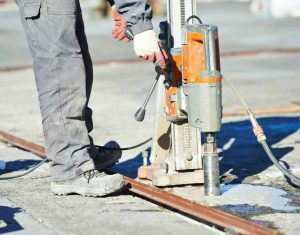 We’ve discussed various other ways to stay safe on the job in previous blogs, but in this blog we will instead focus on five measures for general construction safety. These measures are what everyone on a construction or other work site should keep in mind. Double check your work area and space: Make sure your work space and the surrounding area is safe to occupy and clear of any potential hazards. Scaffolds and ladders are particularly dangerous, as anything involving heights can be. Ensure your safety and those working with you by making sure the scaffolds and ladders have been inspected and are not worn out, rusty, or damaged; most importantly of all, make sure that the scaffolds and ladders have been set up and deployed properly. Exercise constant vigilance with electricity: When it comes to electricity and electrical equipment, constant vigilance is key. Exercise additional vigilance with lifting equipment. Portable, hand-held devices such as grinders and drills should have proper power supply cabling. If electrical equipment is near water, do not allow contact between them. Be sure that proper training has been completed before any equipment is brought to bear for use on a job site. Mend fences and contain fires: Keep fencing mended, and if they are not, inform your site supervisor right away. Proper fencing, and for that matter, railing too, needs to be installed and kept in good repair for maximum safety. Fire is always a definite risk, so be sure that FireStop or FireBlock measures are in place. Know what to do in case of a fire emergency. Wear protective clothing and gear: Another way to stay safe is to wear protective clothing and gear. Helmets, eyewear, earplugs, earmuffs, gloves, and boots are all good examples of protective gear. Wear bright, reflective clothing when working in low light, or at night when vehicles are in constant motion. Also have gear and clothing appropriate to the weather outside. Be sure to keep first aid close by: Keep first aid close by. You never know when you will need it. Basic first aid can help until more advanced medical assistance can be provided. Resting can prevent further injury. This entry was posted on Tuesday, April 11th, 2017	at 2:03 pm	. Both comments and pings are currently closed.